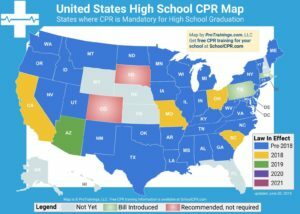 In Illinois, CPR training is not currently mandatory for teachers. It is, however, encouraged that at least one person on staff know CPR. The school board of each public elementary and secondary school in the State shall encourage all teachers and other school personnel to acquire, develop, and maintain the knowledge and skills necessary to properly administer life-saving techniques, including without limitation the Heimlich maneuver and rescue breathing. The training shall be in accordance with standards of the American Red Cross, the American Heart Association, or another nationally recognized certifying organization. A school board may use the services of non-governmental entities whose personnel have expertise in life-saving techniques to instruct teachers and other school personnel in these techniques. Each school board is encouraged to have in its employ, or on its volunteer staff, at least one person who is certified, by the American Red Cross or by another qualified certifying agency, as qualified to administer first aid and cardiopulmonary resuscitation. 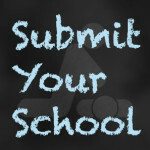 In addition, each school board is authorized to allocate appropriate portions of its institute or inservice days to conduct training programs for teachers and other school personnel who have expressed an interest in becoming qualified to administer emergency first aid or cardiopulmonary resuscitation. School boards are urged to encourage their teachers and other school personnel who coach school athletic programs and other extracurricular school activities to acquire, develop, and maintain the knowledge and skills necessary to properly administer first aid and cardiopulmonary resuscitation in accordance with standards and requirements established by the American Red Cross or another qualified certifying agency.